Questions about the little brothers of the interstate highway system. Among the contiguous 48 states, only two states lack a triple-digit interstate. Name EITHER state - they border each other (sharing more than one double-digit interstate), and both are west of the Mississippi. In 1996, Interstate 476 became the longest triple-digit interstate in the country at almost 130 miles. This was due to the addition to its length of the "Northeast Extension" of what roadway? At 83.71 miles, I-275 is the longest triple-digit interstate that constitutes a complete beltway around a city, as well as the only triple-digit interstate that enters three different states due to a 3.16-mile sojourn into Dearborn County, Indiana. What Midwestern city does I-275 encircle? Interstate 238, a short connecting route south of Oakland, is notably odd in its numbering because it's not a loop road despite beginning with an even number, and for what other reason? With only nine possible leading digits, triple-digit child routes of long parent interstates will inevitably have some duplicate numbers in different states. Fully seven discrete sections of interstate, the most in the country, share WHAT NUMBER, including such varied stretches as the roads crossing the Delaware Memorial and Throgs Neck bridges, and the beltway around Jacksonville, Florida? Two triple-digit interstates reach international borders: Interstate 110 and Interstate 190. Name either of the US cities/metros where this occurs. The movie "Sneakers" tells us that there are "four bridges in the Bay Area," although this is not quite true - there are four bridges reachable from the San Francisco Peninsula itself, but eight total over water in the wider bay. Two of the eight carry triple-digit interstates. Identify the longer of those two bridges, the first bridge north from the Golden Gate in Marin County and the northernmost of the east-west bay crossings, which carries Interstate 580 across the bay. The Goethals, Verrazano Narrows, Triborough, and Bronx-Whitestone bridges, as well as the Brooklyn-Battery Tunnel, all carry triple-digit interstates that do not meet their parent two-digit interstate. What is this TWO-DIGIT interstate, which unlike its four child routes just barely crosses into New York when it terminates at the eastern end of the Holland Tunnel? Although not triple-digit interstates as such, there are two spots along a certain route where the single interstate splits into W and E sections to pass through a metro area (giving interstate signs three characters along those routes). What TWO-DIGIT interstate features both of these sections, a good 930 miles or so separating the two split locations? Two states feature triple-digit child routes numbered after seven different parent interstates. One, probably not surprisingly, is Illinois; name the OTHER state, which features triple-digit child routes of Interstates 24, 40, 55, 65, 69, 75, and 81. At just over a mile long, Interstate 180 makes up the entirety of its state's triple-digit interstates, the smallest total distance within any state that has triple-digit interstate highways. (It is also notable for not being freeway-grade at any point during its brief length.) I-180 is a short spur - almost all of which can be seen in the attached photograph - that is located within which STATE CAPITAL? 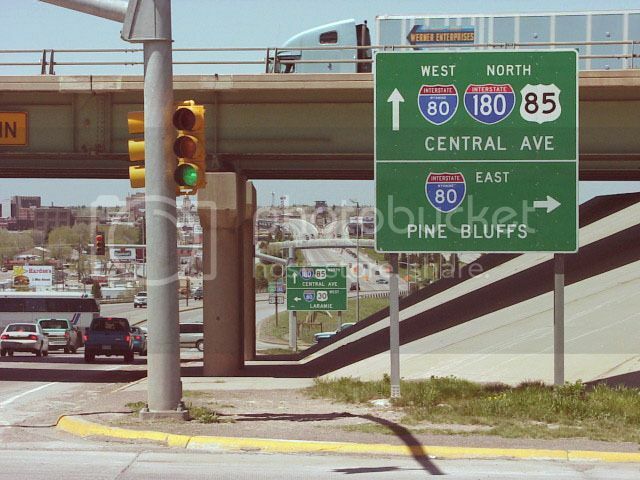 The longest triple-digit interstate to begin with an odd number is the 95-mile I-135. 135 serves as a connector between I-70 and I-35, the latter of which goes much longer before reaching I-70 due to its change to a northeasterly direction not long after entering what state?